So today I think we will start the round up with celebrations. There are quite a lot, big and small. At "There is No Such Thing as a Godforsaken Country, " Ruth is celebrating the publication of our own Margaret Simon's brand new book, BAYOU SONG: CREATIVE EXPLORATION OF THE SOUTH LOUISIANA LANDSCAPE. Ruth begins by sharing her thoughts on a podcast, "Nature, Joy, and Human Becoming," which helped her think about how we might use Margaret's book to help children appreciate the natural world. (The podcast sounds absolutely wonderful, and I'm definitely going to go back and listen to it this weekend). Ruth then uses Margaret's "Ode to a Toad," to write her own "Ode to a Flamboyant Tree." While Ruth is celebrating Margaret's book, Margaret celebrates a new friend, Gienah, that she met in a line at ALA, by writing a poem especially for her. And then Molly Hogan celebrates the beginning of summer. First she celebrates a new month with an Elizabeth Coatsworth poem, "July Rain." And then she celebrates a really special gift she received in the mail from Margaret, as a part of the Summer Poetry Swap. 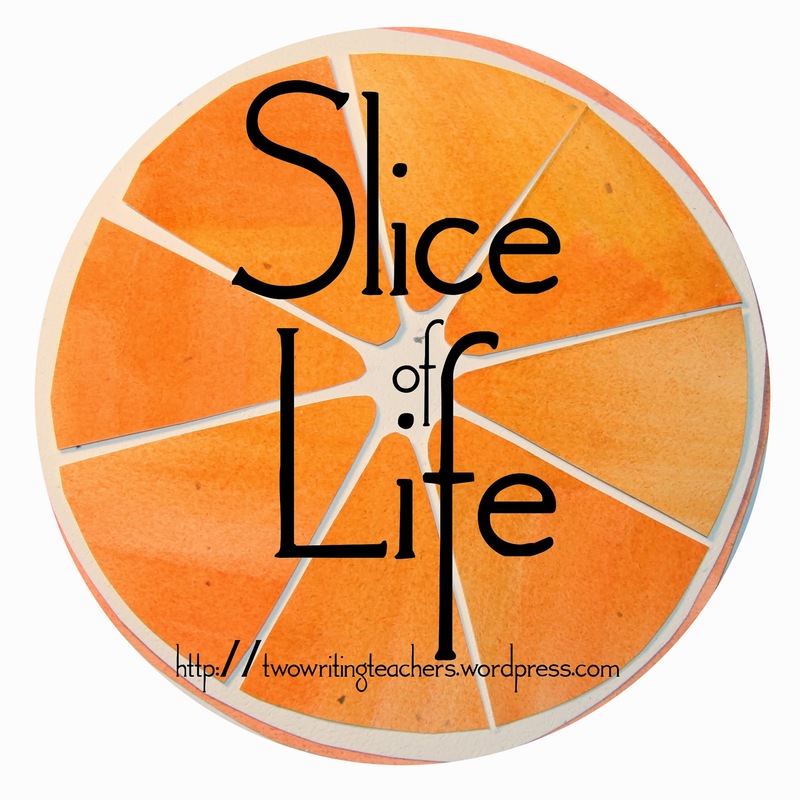 At A TEACHING LIFE, Tara Smith is definitely in a season of celebrating endings and new beginnings. She's very recently (last week, I think?) retired from teaching, and is packing her house, in preparation for a big move to a beautiful farm. In going through her children's drawers, she's uncovering lots of memories. She celebrates her son's early years in school with William Trowbridge's poem, "Taking My Son to His First Day of Kindergarten." Catherine Flynn has a lot to celebrate this week! First, she had two original poems published in Linda Rief's new Quickwrites Handbook. Second, Catherine found a vintage Aileen Fisher book, FEATHERED ONES AND FURRY, (illustrated by Eric Carle) in a culled books box at her school. Catherine shares "Wrens"with us today. Our favorite Aussie, Kathryn Appel, also has lots to celebrate this week. Her book, BULLY ON THE BUS, is making its way across the ocean, and will be published in the United States by Kane Miller. Over at Teacher Dance, Linda Baie has two original poems. 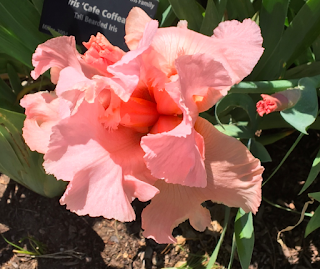 The first captures the desolation we are all feeling in these days, and the second, somewhat like the Lynn Ungar poem I shared today, reminds us to celebrate life's small goodnesses. Thank you, Linda! From The Water's Edge, Erin brings us "Sunset on the Spire" by Eleanor Wylie, another collection of the small and lovely. Donna Smith celebrates the power of the water with "Pulse," an original poem that she wrote earlier this week. Today she has photographs from a family trek to Camden, Maine, which is where poet Edna St. Vincent Millay comes from. Kay McGriff's original poem, "How to Float Down a River," reminds me of how the water refreshes my spirit. Thanks for reminding me that I need to find some water time really soon! Carol Varsalona wrote her first ever cherita to celebrate the colorful palette she finds every day in a garden. It's extra special because she waters her flowers with an heirloom watering can, owned by her grandmother! Another theme that showed up today was big life truths. Tabatha Yeatts, the first poster last night had a found poem in a Harry Beston quote." 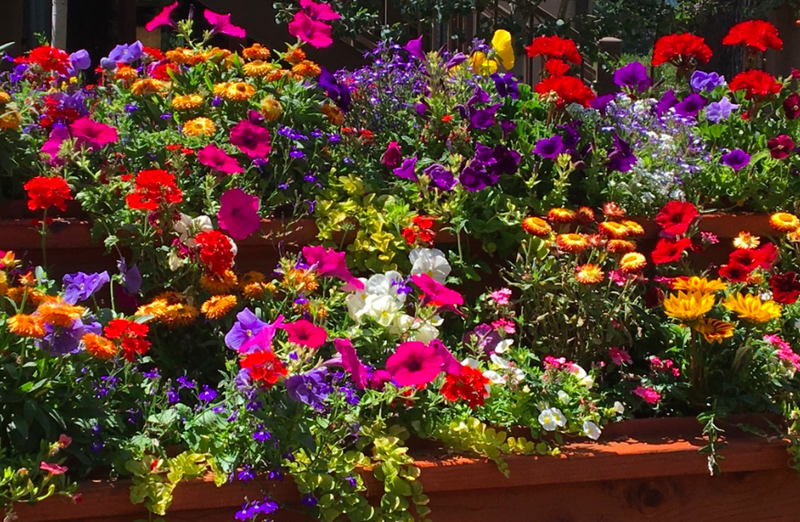 I love thinking about how people are "sometimes very lovely flowers and are always more than flowers." Thinking her poem might be perfect for my sixth graders to read as they get to know each other and become a community this fall. At Gathering Books, Fats Suela introduces us to more big truths in the poetry of Andrea Gibson. I can't help but imagine Lynn and Andrea talking to each other; I think they would have great conversations. Michelle's entry, around the theme of responsibility and freedom includes original art and an original poem, which captures perfectly how so many of us are feeling about the situation on our southern border. Then, as if that was not enough, she also includes art from Charles' White's exhibition in Chicago. Liz Steinglass visited the Holocaust Museum yesterday, then wrote "Shoes of the Dead." If I had to describe her poem, I'd use words like stunning and heartbreaking. Do not miss it! After several days of record breaking temperatures in Denver, it's refreshing to read Laura Purdie Salas' poem, "A Thousand Nicknames for Snow." I love all of the different perspectives Laura brings in and am hoping she will say I can use it with my sixth graders this year. I'm always intrigued by the journey people take in writing a poem, so reading about that was an added bonus to Keisha Shepard's original poem, Summer Wind, which was born after she heard a line in a song last week. I have not yet tried writing a cherita, mostly because I think it would be really hard to shape a story in that way, but over at Random Noodling, Diane Mayr is continuing her series of ekphrastic cherita, this week's are about the circus. And at Kurious Kitty, Diane celebrates the life of Poet Laureate, Donald Hall. Heidi Mordhorst helped kick start Taylor Mali's metaphor dice project, and she used her set to create a full length metaphor poem, "funhouse," in which she compares her heart to an "unruly mirror." Alas, those of us who didn't get a set of dice in the kickstart have to wait until November. intrigue me. I wonder, are there some genres, e.g. fiction, that I am always writing, whether it be in my head or on paper; and other genre, such as poetry, that are more elusive, and that I have down on paper more quickly, before I lose them. Welcome! Poetry Friday is here today! Every time it is my turn to host Poetry Friday, I hope I will think of something special and wonderful and spectacular to share. Mostly I don't. But today, I think I kind of do have something, or at least someone, special and wonderful and spectacular! Please allow me to introduce you to Lynn Ungar. Lynn is a Unitarian minister, a dog trainer, a singer and contra dancer. She lives in the San Francisco Bay Area with her wife and teenage daughter, and several dogs and cats. Most importantly, at least for today, Lynn is a poet. I don't even know how exactly to describe her poetry, except to say that she uses small details to share big truths, just like Marge Piercy, and Mary Oliver, and Barbara Crooker do. She reminds to watch and breathe and celebrate the miraculous ordinary. And somehow, in these weeks when every day seems to bring new atrocities and new sadness, that's very comforting to me. Here is a new favorite poem that I found on Lynn's website. What will you do with the last good days? engineering the profits of banks. open to such a vast, pervasive sadness? Wake up. Give thanks. Sing. Another poem I absolutely loved, and actually considered sharing, is Camas Lilies. On the website you can read more of Lynn's poems. You can listen to Lynn read several of her poems, including "The Last Good Days." You can read other writing by Lynn or read her musings, which are also poetry. You can buy Lynn's book, BREAD AND OTHER MIRACLES, here. Leave your comments below and I will upload them throughout the day. I'm learning some new things about teaching this week. I'm learning them from my dog. I've had dogs most of my adult life. First there was Ramsey, then Maggie, Star, then Jack, and finally Boo. All of them have taught me something. But this week I'm learning some brand new lessons. It all started about a year ago. I ran into Debbie, a friend who I taught with years ago. Debbie was accompanied by Shadow, a huge black lab she is training for Canine Partners of the Rockies. I told her I have always wanted to do something like that, and she invited me to come to class with her some Saturday morning. I've been going since about November and recently, I decided to step up my game and become a puppy sitter. I actually want to raise a puppy but there are several other obstacles in the way right now. To be a puppy sitter, you have to have a home visit. They check to make sure that your house is safe, and that you have a good fence. They also check out the pets that already live in the home. Debbie has worked with CaPR for several years, so she can do the home visits. Star is not always really excited about other dogs, but her dog Shadow, is really mellow, and really good with other dogs, so the director of CaPR thought it might work to try with him. It didn't go well at all. Debbie and I went to class one Saturday and then brought Shadow back to my house. We brought him in through the front door and let the dogs sniff each other a little. That went ok. As soon as Debbie let Shadow off the leash, however, the action began. Shadow immediately trotted over to Star's food dish. It was empty (like it is two minutes after I put it down every morning) and I didn't think it would be a big deal. Star did. She did not want Shadow checking out her food bowl. If there was a single morsel left in there, she wanted to be the one to find it. She growled at him and showed her teeth. It went similarly when he picked up a toy. We have had that toy since Christmas and Star has never played with it, so again, I didn't think it was a big deal. Star evidently did, because she growled and bared her teeth again. Debbie put Shadow back on the leash and they left shortly after that. She and I pretty much thought that was the end of it. If Star couldn't get along with other dogs, even a really mellow, well-trained almost service dog, we definitely didn't think she could get along with any of the younger dogs, who are much younger and not nearly as calm. The trainers from CaPR didn't think that was necessarily true. They wanted to come over with Pete, another dog in advanced training. They thought they could work with Star. They came last Thursday. They set up the learning conditions very differently. For starters, Pete didn't come in the house right away. First one trainer walked him down one side of the street and the other trainer and I walked Star. It was fine. Then we tried crossing the street and passing each other, first with the dogs on the outside, and then with the dogs on the inside. Everything was still fine. We walked to a nearby school and practiced passing each other, then walking side by side. Everything was fine, but I still wasn't convinced. Finally we tried taking Pete into the house. Before we did that, however, the trainers made me check to make sure the conditions were ripe for success. I had to pick up the food bowls and all of the toys and bones. Star's food canister, usually in the corner of our dining room, went into the laundry room, with the door shut. Star and Pete came inside and Star was the hostess with the mostest. Friendly, mannerly, playful. Pete ended up coming back for the night. This week Shadow is here for the entire week and it's going fine. The two dogs play with each other for awhile, then, because it's really hot, they collapse on the cool wood floors. After a little rest, they are ready to go again. As I'm watching them, I can't help thinking about school. Star wasn't successful at all, the first time we brought Shadow over, but it was because I set her up for failure. We didn't start slowly. We left the toys and food dishes, known sources of conflict, out in the open. When the CaPR trainers came, they started slowly and gave Star ample opportunities to be successful in a controlled environment. When we brought Pete back to the house, they again made sure conditions were right, and that they dogs could be successful. Even though I am a pretty good reading teacher, with lots of strategies in my boxI think I do the same thing to kids way too often. I take a kid that hasn't quite found her groove as a reader. I tell the kid to choose a book on the first day of school and offer lots of options. The child doesn't know how to make a good choice, or there are too many possibilities, and she fails miserably and thus I reinforce her conceptions of herself, or remind her of previous failures, and thus I start the cycle of failure all over again. I wonder what it would be like if I adjusted the conditions just a little. What about if I made sure Reina Telgemeier's graphic novels were on her table? What about if I threw a couple of picture books into each table's basket? Or book talked a series I knew she could read that first day, and then casually left the book on her table? Might she be more successful not just that day, but for many days to come? I'm going to be thinking about Star and Shadow a lot as I start this school year. They have reminded me that my choices, as the teacher, really do matter. 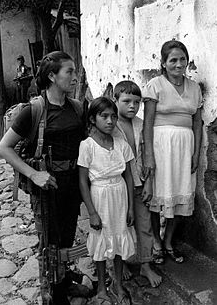 Like millions of other Americans, and others around the world, I have been deeply, deeply grieved by the photographs that have emerged from our borders this week. I know those children. I teach those children. And I can't bear to see them locked up in cages, apart from their parents, with no toys or books or love. So, so sad. So, so scary. So absolutely, incredibly, fundamentally wrong. On a personal note, I know, firsthand, about the damage that is being done to children's hearts and minds and bodies. My sons, who I adopted at ages 7 and 9, live with Reactive Attachment Disorder every single day. We have been a family for 15 years, twice as long as they were in the foster care system (which I am not in any way comparing with the current situation at the border), and even now, 15 years later, they struggle. Despite years and years of therapy, they don't attach deeply to other people. They have acquaintances, but not deep friendships or girlfriends. They turn to substances to dull the pain and fill their lives. I fear similar issues for all of the children who are torn from their parents' arms and locked in cages. Penny Kittle shared this poem, which originally came from Tricia Ebarvia, on Twitter yesterday. The author, Warsan Shire, is the daughter of refugees from Somali. Penny shared the poem with the tweet, "This poem should be in the hands of everyone this week." I agree with her. Sometimes poetry is just way more eloquent than I could ever hope to be. Michelle Kogan is hosting Poetry Friday. For her post, she reviews Margaret Simon's new book, Bayou Song. I can't wait to get hold of a copy! Congratulations, and happy book birthday, Margaret! Next Friday, the Poetry Friday Roundup will be here! It only makes sense, then, that I would love a book about a dog that works. And that I would love an author visit by an author who wrote about his working dog. On Saturday, I went to Tattered Cover. I went specifically to find Naomi Shihab Nye's newest book. VOICES IN THE AIR. I didn't find that, but on the way into the children's department, I passed by a book display. 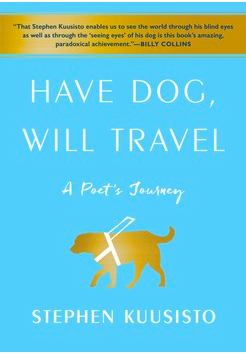 HAVE DOG, WILL TRAVEL: A POET'S JOURNEY was on display. I didn't buy it, though, that day. and actually read a few of the books I already own. Instead I waited until yesterday. I had been cooped up in the house all afternoon. I decided I would attend Kuusisto's reading. And of course I had to buy the book. Kuusisto is a professor at Syracuse University. He was born in Durham, New Hampshire, where I did my doctoral work. He was legally blind at birth, but grew up being told by his sighted parents, that he should act like he could see. And so he did that, devising elaborate systems to help himself function in a seeing world. He went to college, and then to the Iowa Writing Workshop. He became a professor. It wasn't until he lost his job at 38, and didn't have any options for another one, that he decided that he would acknowledge his blindness, and get a guide dog to help him move through the world. He described the book as a love poem to Corky, his first dog. Now he is on his fourth dog. Kaitlyn is a four-year-old yellow lab. She accompanied him last night. curled up next to him on the rug, sound asleep. so she could be a dog and just say hello to people. She especially liked my coffee. and stayed up until almost midnight reading the book. 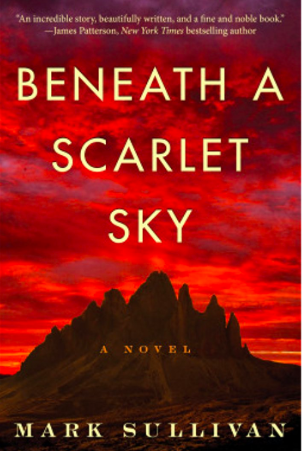 I have spent the last few days devouring BENEATH A SCARLET SKY by Mark Sullivan. The book is marketed as fiction, but is really more a narrative nonfiction. In the author's notes at the beginning of the book, Mark Sullivan says that the book is based on the life of Pino Lella, and set in Italy during WWII. Because so many documents were destroyed at the end of WWII, and because so many of the people involved have since passed away, Sullivan couldn't verify many of the conversations. For that reason, it's considered fiction. When the book opens, Pino is 17. The Nazis have just begun attacking Italy and Pino and his younger brother Mimo narrowly avoid being killed in a theater that is bombed. Shortly after that, their parents send them to the border of Italy, to stay at a Catholic boys school. There, Pino is responsible for helping many Jews cross through the Alps to Switzerland. When he gets close to 18, his parents summon him back to Milan, and encourage him to enlist in the German army, so he won't be drafted and placed on the front lines. Through a fluky train of events, he becomes a chauffeur to one of highest ranking German officers. This allows him access to some of Germany's deepest, darkest secrets, which he then passes to the Italian Resistance. I love historical fiction and narrative nonfiction, but had read almost nothing about Italy during this era. I learned a lot, then, in reading this book which is right up there, for me, with Anthony Doerr's ALL THE LIGHT WE CANNOT SEE, which is one of my all-time favorites. This week I attended a district literacy training. One of the sessions that I attended, they talked about Overdrive, a tool that allows kids to access books on their computers and phones and tablets. 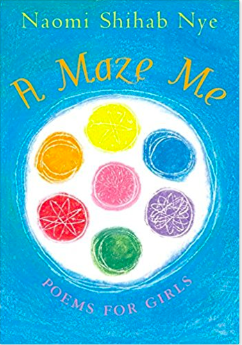 While I was messing around with that app, I stumbled across A MAZE ME by Naomi Shihab Nye. I first thought it was a new book, then discovered it was originally published in 2005, then re-published, (maybe with a different cover?) in 2014. At any rate, I loved the poems. I also loved the foreword, which I think will be perfect to use with sixth graders the first week of school. every day is a good day if you have it. I had to think about that a minute. someone left at your birthday place at the table. don't miss the bottom of the box. "If the Shoe Doesn't Fit"
Karen Edmisten is hosting Poetry Friday this week. She shares "Sustenance," a beautiful poem by Barbara Crooker, and then her own "Sustenance" poem, which is equally beautiful. I probably should not admit this, but last week I was a big, fat, quitter pants. During Christmas break, I decided this was going to be the year that I really did get better at Spanish. And so I signed up for a class. And I've been going every Tuesday. It costs about $30 a session. Even with a teacher discount. And it requires a time commitment. Lots of vocabulary and verb conjugations to memorize. And there are tests every couple of months. But most of the time, I really like the class. so we really do get a lot of time to practice. I like that most of the people are at about the same level as I am. But the last couple of weeks have been really, really hard. And then a new session started and two new people joined. They are sisters. And they are very nice. But they are way, way, way better than the rest of us. And it kind of tilts the dynamics of the class. Not to mention that I always seem to get paired with one of them for partner work. and I make so, so, so many mistakes. Last Tuesday was the ultimateawful. I had been traveling, and had a 21 hour day on Monday. followed by a doctor's appointment I was really dreading. I would never catch up. We started with a warmup using a verb conjugation that I use all the time at work. It's one of my fall backs when I can't figure out how to say something. Probably ten or twenty times every day. Maybe that should have been a sign. Then we went on to a different activity. It was a partner worksheet. have experienced at one time or another. The Spanish teacher finally gave up and had us put the worksheet away. "I think I'm too stupid for this. Can I just listen to everyone else?" that didn't quite work either. And I just kept feeling stupider and stupider. of every other student in the class? I wasn't going to come anymore. I knew I had probably done something stupid. because Spanish is really hard. But you really wanted to learn Spanish. You are getting a lot better. and asked if I could come back. And so I have studied a lot this week. and on the Duolingo website. And I wanted to make sure I am ready. But this experience as a learner has also made me think a lot about myself as a teacher. Does the content always have to be rigorous for learning to occur? What is the role of success in learning? In what ways am I making the learning harder than it has to be? Are there days when kids should simply be allowed to opt out and listen? will definitely impact me this fall as a teacher. of when their teacher was a big fat quitter pants. that learning is hard work. Since I'm going to teach sixth grade literacy, my goal this summer is to read a lot of books that I could recommend to kids that age. Realistic and historical fiction are really my favorite genres, but I'm trying to read others, that I'm not as likely to follow. I've loved Mike Lupica for years, so when this book showed up in my Scholastic orders, I picked it up. LAST MAN OUT is the story of Tommy Gallagher, a middle school strong safety on the Brighton Bears football team (Side note: As the mom of two former football players, I loved that this book was about a defensive player, many of the football books I have read feature offensive players- quarterbacks, running backs, an occasional wide receiver). In the first chapter, Tommy is playing in a football game when his family is notified that his firefighter father has been killed in the line of duty. Each member of the family copes in different ways- Tommy still loves football but struggles because his dad is no longer there to practice and coach and advise, so he turns to skateboarding to fill the hole in his heart and life. (I kept thinking about the list of do's and don'ts I always got at the beginning of each sports season. Pretty sure my boys would not have been allowed to skateboard because of the potential for injury, but maybe that's not true on every team). Tommy's younger sister, Em, a star soccer player, quits her team and spends hours and hours alone in her room. I think this is one of those books teachers need to have in their repertoire because some day some kid who has lost a parent will need it. A solid story about grief and integrity and learning to move forward when life has changed and it's really, really hard. I hated junior high. Hated it. I went from playing on the playground at Longfellow and Stratton and Madison Elementary Schools, where "smart" was an acceptable currency to Washington Irving Junior High, where no one wanted to be smart and all the girls wore makeup and the cafeteria served brown hamburger gravy over rice or mashed potatoes, and no one liked it, but no one brought lunch from home because that wasn't cool. And I didn't understand, somehow, that everyone felt as uncool, and uncertain, and unloved as I did, and that's why so many kids were so, so mean, and so, so, so unkind. 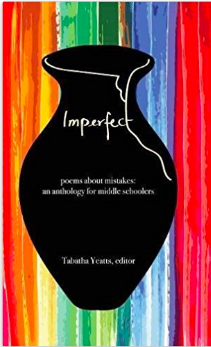 I think maybe that's why I fell in love with IMPERFECT: POEMS ABOUT MISTAKES, AN ANTHOLOGY FOR MIDDLE SCHOOLERS, Tabatha Yeatts' new book. I know other people have already reviewed the book, so I won't spend a lot of time on it, other than to say it's a collection of more than seventy poems and quotes about making mistakes. The kind of poems that you read and just know that the poet was inside your life or inside your head. Poets include lots of folks that show up at Poetry Friday every week and then some other "classical" poets, like Ella Wheeler and Carl Sandburg. There are endnotes about making good decisions and apologizing effectively. I LOVE the book and can't wait to share it with the sixth graders I will be teaching next year. without frustration being a frequent visitor. some days all before lunch. There are tissues on the teacher's desk. if you try not to roll yours at her. Or any other age, really. We're all just figuring it out as we go along. Make a mistake for goodness sake! Take a risk in being wrong. Write the words to your own song. Be wild and woolly whenever you can. Be foolish and daring and brave. Be silly and fun. Skip when you run. And try not to always behave. Be honest and fair. Act like you don't care. Be loving and caring and free. Just be yourself. Take care of your health. And don't listen to people like me. taking up all the room? Kiesha is hosting Poetry Friday at Whispers From the Ridge. Head on over to read lots more great poetry.